Xeikon NV, an innovator in digital color printing technology, announced today that it has received the prestigious 2014 InterTech (TM) Technology Award from the Printing Industries of America (PIA) for its breakthrough ICE toner, which is specifically designed for heat-sensitive substrates, such as Polyethylene (PE) face stocks, thermal transfer labels and In Mold labels (IML). The InterTech Technology Awards recognize ground-breaking technologies that are predicted to have a major impact on the graphic arts and related industries. According to PIA, more than 80 percent of the technologies that have received this award experience continued commercial success in the marketplace. The PIA is the largest graphical arts trade association, representing an industry with about 1 million employees and thousands of member companies. 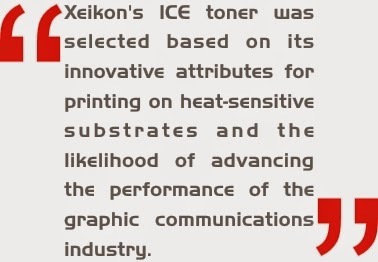 Xeikon's ICE toner was selected based on its innovative attributes for printing on heat-sensitive substrates and the likelihood of advancing the performance of the graphic communications industry. InterTech Award recipients will be recognized at the Premier Print Awards and InterTech Technology Awards gala on Sept. 28, in Chicago, IL. Xeikon has received the InterTech Award multiple times in the past. Most recently, Xeikon had received the award in 2012 for its Xeikon X-800 VariLane technology, which allows label converters to create digital imposition templates for labels of different SKUs, and different sizes, within the same print run, thereby reducing material waste and increasing productivity. "This is a great honor and a huge credit to our entire organization, from research and development to sales," said Todd Blumsack, Xeikon's VP of Sales and Marketing - North America. "All of our innovations, including the ICE toner, are customer-driven. Label converters wanted dry toner technology to be capable of printing on heat sensitive substrates, while retaining our 1200x3600 dpi imaging resolution, full rotary imaging, food safety and the capability to print on conventional substrates without the need for any pre-treatment. We're extremely happy to see that the judges have recognized our efforts." Based on Xeikon's proven QA toner technology, the ICE toner is perfectly compatible with all the press models of the Xeikon 3000 Series of label and packaging presses.